Temporary Floor Protection Pads guard large areas of flooring quickly and easily. Great for protecting stair landings, foyers and more during construction, remodeling, moving, or house showing. 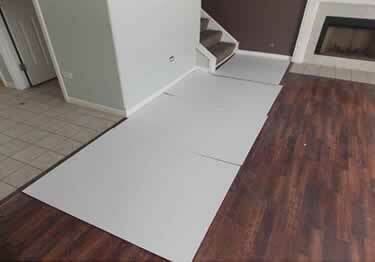 Protect foyers, landings and more with KSC's durable cardboard Temporary Floor Protection Pads. Won't rip like traditional paper protection and its adhesive backing makes installation simple!